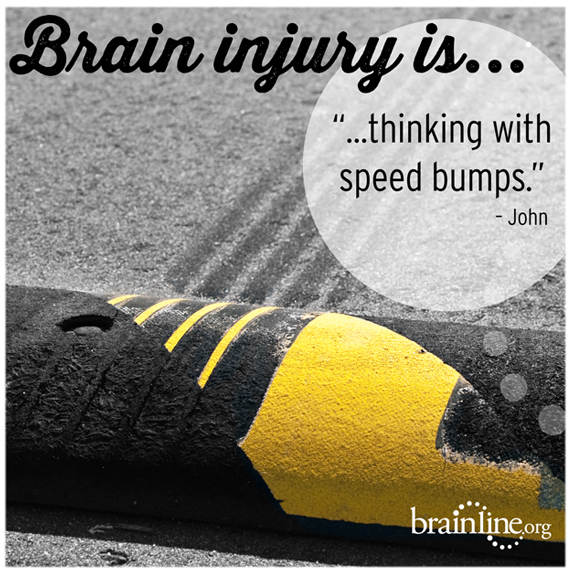 BrainLine asked our online community to share their personal definitions of traumatic brain injury, and the list below captures some of the many responses so generously provided by people with TBI. We encourage you to add your own definitions in the comments section below, and to join the BrainLine community on Facebook, Twitter, YouTube, and Pinterest. A puzzle … all the pieces are there but in the wrong order. When the cursor disappears from your mental computer screen. Brain fog, confusion, difficulty learning new things, being able to be “high-functioning” but being very slow at it. Scary. I look the same but I feel like someone else. MIA or AWOL … Missing in Action or Away Without Leaving! An invisible memory-taker, mood-changer, life-changer! Like being under a constant waterfall and I’m just trying to catch my breath and not drown! Like an earthquake in my brain that knocked down bridges and damaged highways and knocked out some —but not all —lines of communication. Some of these things get rebuilt more quickly than others, and some are easily re-damaged. Like having everything in your life suspended in Jell-O, and just when you reach out for something, the Jell-O gets blended. A family affair … when a family member has one, it affects everyone. A constant struggle for the rest of your life … you know how you used to be and you want your life back … but it won't happen … it's like living in thick fog. Scrambled egg between my ears. The absolute hardest thing that you can imagine going through!! Unbelievably frustrating and isolating. Learning to live in a brain that sometimes feels like it belongs to a stranger. Forgetfulness and a total personality change. Scary. Frustrating. Annoying. Funny at times … sometimes I feel rather than get frustrated about one of my deficits. It’s better just to laugh about it. Limiting, difficult, having to “relearn” things you thought you already knew. Like having the flu all day, every day … for the rest of your life. Trying to catch clouds in a windstorm. We hope you will share your own definitions in the comments section below, and to join the BrainLine community on Facebook, Twitter, YouTube, and Pinterest. Posted on BrainLine August 19, 2013. After my bleed I became rude, verbally nasty, and would ask very personal questions to people, But the most devastating effect was the loss of memory. I forgot how to cook, how to play the organ. I became unable to deal with money effectively. I am emotionless, haven't cried since the bleed. Feeling like I’m just outside the lines of everyone else. Notes, quotes, alarms and self-help scheduling. Feels like I Went from high-speed internet to prodigy dial-up. Whole sensory system got amped up. Now I can hear, taste, smell and feel things I couldn’t before. I’m not always finding this to be some kind of superpower. (Except when I could smell a gas leak at the end of my driveway when no one else could). Every single thing in my life seems like such a struggle to do. The phrase, “out of sight out of mind” is no longer funny to me. It’s real. And I have no idea how to explain this to people that see only the outside of me. It is really frustrating when people say "but you don't look disabled" . I feel worthless, not accepted, emotional, very angry, agitated, no control in own life, tired, dazed, hurt, misunderstood, ugly, body won't turn off heat, non-balanced in walking, suicidal. After being hit at a red light by a porta-potty truck at a very high rate speed, all I know is I am alive and hate to be on majority days. I don't like mirrors as I feel ugly due to no one understanding the way my brain feels like it's going to to explode. All I hear is "be or act normal" as these LV Drs would say to do! I even tried going back to work to "be normal" and started forgetting the names of people I have worked with nine-plus years, forgetting procedures, or just not comprehending the new training material. Nothing is normal about me anymore. Stuttering on days, wanting to drive off the freeway on days. I am scared of myself. I know exactly how you feel, and I feel the VERY same way most of the time. I am sorry, I wish I could find a fix, either for us or for society. Something that helps me is prayers (from myself) and others so if you are a prayer I would greatly appreciate any prayers, and I will be praying for you and others with our same concerns. Another thing is an app on my phone called Lessons in Life Quotes. It has hundreds of inspiring quotes. Then in 2014 (in 5 days it will be FIVE years) I had two strokes, and then a ruptured brain aneurysm which required a month in ICU on a ventilator. I had many setbacks: bacterial meningitis, vasospasms, hydrocephalus, double pneumonia. It also affected my hypothalamus which causes temperature irregulation. It could be 50 degrees Fahrenheit and I'll be sweating in a tank top and shorts. It is just another ANNOYING one of the million effects of this. I know I have a lifetime ventriculoperitoneal shunt (VP Shunt). I have lost so much and now have been diagnosed with a rare condition called Moyamoya. My left carotid artery is 100% blocked so I have been told to watch for right-sided stroke. I was only 40 when this happened, and now 45. Most people don't survive. I do understand that. Like you, some days I think "what is the benefit?" That's enough negativity out of me today. Have a wonderful day and God bless. In rehab I too could not look into the mirror in my bathroom. For the same reason. Thanx Dawn. I decided today I needed to start some sort of therapy I had emergency brain surgery two years ago and went from a high functioning surgical RN to a retired angry, depressed person. I had never thought about what I would do in retirement, and now I have numbness and limited ability on my left. I also have right, left, and number confusion. My spouse is nonsupportive and says to me "welcome to old age." He also has no patience with my confusion and yells "WHAT DON'T YOU UNDERSTAND?" He also can't understand my inability to cope with loud music or radio noise. He blames me for doing it on purpose to piss him off. Sorry for the long complaint! I feel isolated and alone. It feels like I’m not in the real world anymore. Confusion, moments of clarity, more confusion, you can hear things but you aren’t listening, like the sound the parents make in Charlie Brown movies “wa wa wa” monotone honks you aren’t listening to. Anxiety not of physical harm but of not being understood, as if I had some type of autism. Used to be smarter and articulate now just trying to achieve bare minimum. Used to be pretty empathetic but it seems like I have none to spare for others, I spend it all on my self. Self fulfilling prophecies don’t apply to it and there is no initiative to take to get over it. Take the help you can and let time heal. Don’t make anymore dumb decisions. My brain has become like a mobile phone. Still clever, but the batteries drain quickly and when the last bar disappears my brainpower goes in one second to zero. Then just stop talking to me please, I can't accept your talking anymore and this annoys me greatly. U just want to go back to being u; but ur gone. Everything is scary cause it requires thought. Nothing is automatic anymore. Confusion leads to anxiety. Which leads to fear. Which leads to being alone. It is like living with a demon in your head, being forever careful to contain the enemy within, while it destroys your memories and sense of who you are. My life now is just snap shots. My wife misses who I was. Me too. How do I explain to someone I now have dizzy spells panic attacks anxiety memory loss that I'm slower and things are harder for me when I can't even understand how why this happened or who I am anymore.?!? Jennifer, you took the words right out of my mouth! My brain surgery didn’t leave me so out of whack that it would be easy for all to see. It left me just off enough that I no longer feel or sometimes think like the way I use to. For me it’s like my “flow” of life was taken. After my surgery, no one talked to me about the mental health issues I could have after. Nor did we get any paperwork. So “looking fine” on the outside, therefore, left everyone thinking I was ok on the inside. No one believed me. I was told it was just anxiety and to get over it. Thanks, people, not very helpful. I struggled and searched for answers for four years before I was acknowledged as having brain trauma and that I wasn’t making all this stuff up. My husband threatened divorce as extra added STRESS! Ya, how do you tell someone what is going on in your head, when you can’t even figure it out. All I know is I don’t feel like the same person I was before the surgery. I’m still having a problem with the oh so much SLOWER pace that I have to be at for my brain not to get tangled up in knots, and go crying into the next room. People tell me to go to a support group. Ok, which one? Brain injury, stress, anxiety, depression, memory impairment, ADHD, bipolar, marriage counseling or possible divorce. Feeling like I don't belong anywhere. Wondering if death would have been easier. I look in the mirror and see the same face but then I open my mouth and hear a stranger. Loneliness. I look into the mirror and see someone who looks similar to me, but it's not me. The real me is gone. Erika, this is the first time I have heard anyone mention looking in the mirror. I have the same experience. I see my face, but I don't "see" me. I also feel like I don't belong anywhere, even in my own home. A lot of people (family and friends) get frustrated with all of the behavioral changes, especially since, like most, I look the same on the outside. I have started meditating. Not easy to keep my mind "still", but I am finding that it is helping. Michelle, no apologies (referring to your second comment). I understand completely. Meditating is tough. My brain wants to keep going and going, so I try to concentrate just on my breathing. Sometimes this works. I am registered for a TBI yoga class that is starting in few weeks and I am terrified. I wish you the best and God Bless you too. My experience, Post-TBI (and viewed in the most positive way), has been like starting your life all over again. Most obvious to me is that, after the injury, I cannot attend elementary, middle, or high-school again. If anyone can understand that without that educational foundation, attending college (because that is where you find adults) in order to further one's education, could be equated to someone learning to swim by being dropped-off in the ocean not knowing which way to go. I am not suggesting that recovery (learning to swim) is impossible (depending on the extent of the damage), but the path is littered with hills and valleys. Depending on the Day, those "hills" can be mountains and some of those "valleys" may as well be cliffs. Imagine an 8 inch funnel full of water with your finger plugging the outlet. Now sprinkle glitter into the water. Imagine that each piece of glitter is a thought or idea. Remove your finger from the bottom of the funnel and then realize that you have no control over which thought or idea will come out next. . . . Welcome to my experience. I have found humor (as well as truthfulness) in the following quote credited to an unknown author: "Better it is for you to think me a fool, than for me to open my mouth and remove all doubt." My mTBI happened on July 11 this year from a fall onto rocks. Four and a half months later it still feels frustrating as hell - like I am a stranger even to myself some days. You do things and misunderstand people in a way that you would never have done pre-mTBI when your cognition was at its best. You can no longer control your temper and lose it saying horrible things to the people that care about you most - and feel awful when the emotional launch is over. I struggle to cope with bright and artificial light - not ideal when you have to close your eyes in the car as a passenger and realise driving is not on the horizon anytime soon. I also struggle with noise - not good when you are a teacher! I am still not back at work yet due to the driving I do as a Resource Teacher and my work colleagues do not seem to understand just how crippling the fatigue actually is - it could be deadly if I was back at work. I am also trying to finish a Post Grad paper - retention of detail and the ability to locate the words I want to use in my assignments used to be easy but not now. My biggest discovery to date and something that took some work to get my head around is that recovery from mTBI is not linear and, even though I look fine on the outside, it is still pretty mucked up on the inside. I describe my BI as if my mental filing cabinet was shaken and the files were all put back in a complete random mess. I've spent the last 18 years reorganizing the filing cabinet and amazed to still find misplaced files. Speech is still difficult. I feel like nobody understands and as if they think I'm pretending to have the symptoms . I feel exactly the same way. I look the same on the outside but have such extreme difficulty dealing with my day and nights. My brain injury is from a 2nd concussion and people do not understand why 11 weeks after, that I am still having issues and not back at work. It's not like I had a stroke or have been in a major car accident. Looking down at your hands, and not recognizing them as your own. When you speak, and your voice sounds unfamiliar. Being unable to have a simple conversation because your mind becomes emptier than ever before after only 5 minutes. 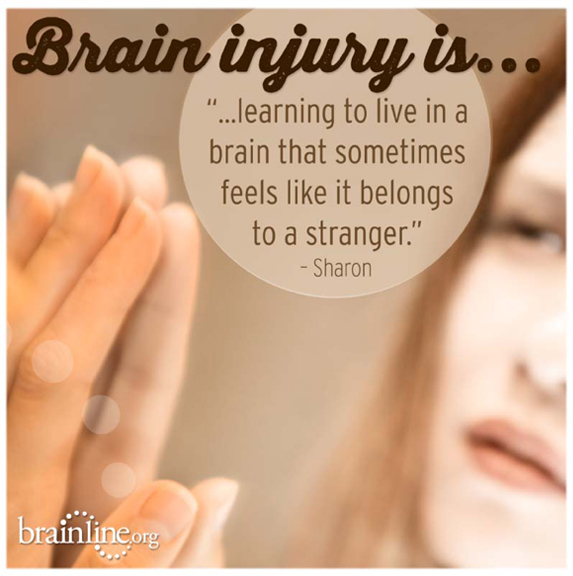 Brain Injury is learning to live a life that doesn’t feel like your own. It’s an ongoing battle of feeling like somebody else is driving and you’re just along for the ride. "A constant struggle for the rest of your life … you know how you used to be and you want your life back … but it won't happen … it's like living in thick fog." I've used the "fog" analogy many times. You can see what's immediately around you, but trying to think beyond the fog takes enormous effort and is ultimately impossible. And that can be immensely frustrating and brings up feelings of resentment and anger. Was in a fog for a long time maybe 3 or 4 months. I was an engineer and used complicated computer programs, including Autocad. Lost all knowledge of them never to return. After seven months I became an out of control angry person. The doctor prescribed Celexa (an off label prescription). It worked wonders. I've been taking it 20 years. Tried stopping it twice but uncontrollable anger returned after 3 or 4 days. The left side of my brain is damaged about 15%. Problem spelling and higher math functions. Friends often realize that you are not quite the same and sometimes find you strangely off key. I'm often misunderstood and lonely. I had brain cancer, about 20 years ago glioblastoma , which I was suppose die in 18 months. but nobody told me and so I keep living and thank God, I had six kids and now I feel like the child. With the way my kids treat me. I feel like they are always talking about me they don't trust me to hold the babies which are my grandchildren. After about five years after my one daughter had her children. She comes in for Thanksgiving and she lets her kids stay overnight at my house. Maybe it's because I got married again. I try helping my brain get stronger by playing brain games on the computer, I have a of trouble with my spelling and my math. Sometimes I wish I didn't survive this cancer, but then I did and now I just live with it. I have wonderful husband who accept me for me. I can't ask for much more I would love My children to visit me more, can't do anything about that either. life throws you a lot of curve balls I got too many. I had brain cancer and I forget how to spell and have trouble retaining things all of the time. I feel like I am now the child and I had six children. They don't all understand how I feel how it's not fault, it was something that happen to me. 2015, I died in my mind. Now I have no idea who I am. I knew what I was. But she is gone. I see the face but the brain is off. MIA Missing In Accident!!!!!! I have changed 180 degrees. I hate the new me. My voice, foods, smells, lights, noise, music. I hate who I am now!!!!!!!! continue with what you were doing, but wanting to tell them to shutup. This is me. + I used to be such a social person. Now I am a homebody.